The recent days leading up to Stout Burgers & Beer opening their third location just off the Promenade in Santa Monica, it felt akin to the days before Christmas. I was giddy with excitement. I could not wait to unwrap my presents. A good friend forewarned me though: "Your burger's going to arrive at your table and upon first impression, you may be a tad underwhelmed. It won't look like it's packed and stacked with flavor. But, trust me, it is. It'll be one of the best burgers you've ever eaten." My buddy was absolutely correct with this assessment. Unlike the food pornographic photo you see above generously provided by the restaurant (mine came out way too dark), the burgers at Stout arrive hidden underneath their golden shell of a brioche bun. Yet, upon first bite (or first peek under the hood), you are welcomed with a dizzying concordance of flavor. That's right, a dizzying concordance. It's almost like there's a whole new, undiscovered world under that bun. Like "Legends of the Hidden Temple" or something. A delicious "Legends of the Hidden Temple." 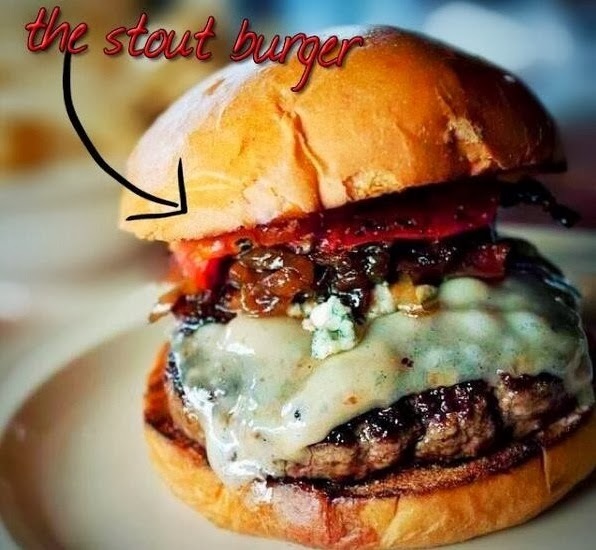 Especially for their namesake burger, the Stout Burger. We're talking about a nicely browned/crusted patty with blue cheese, gruyere, rosemary bacon, carmelized onion, horseradish cream and roasted tomatoes. Despite all these varying flavor profiles, the Stout Burger really works and succeeds unlike many LA burgers. There's so much going on, yet it all works rather harmonically. I can very comfortably place the Stout Burger, on first taste alone, in the upper Unemployed Eater Santa Monica Burger echelon. Obviously an incredibly coveted place to be, it certainly belongs near the top of the list, amongst the Father's Office Burger, Rustic Canyon Burger and Hole in the Wall burger. Only problem: it will be hard to ever order a different burger there - and the others sound mighty damn fine as well.